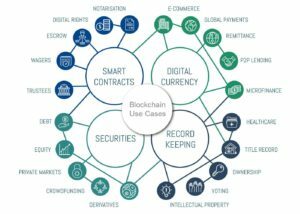 In Part 1, we explored the building blocks of blockchain – bitcoin and smart contracts. These top level basics of blockchain work quickly toward more complex operations. Step by step block chain applications are progressing right now in today’s industries. It’s as easy as 1-2-3D. As the tactical is utilizing bitcoin and smart contracts to execute stand-alone functions for test and evaluation, the next step is to pull the isolated applications into a third dimension, kinda like the third semester of calculus. For the US Navy, that opportunity could be implementation with Additive Manufacturing. Here’s why. Although 3D Printing was developed in the 1980s, the feasibility of metalworking for parts such as nuts and bolts didn’t mature until the 2010s. Thus the capability being explored is founded in practice and yet still molding (har har) into full application – in regard to the grand scale of spare parts that the US Navy demands. Because of the newness, the technology and its deployment are still pliable. Spare parts are a significant contribution and yet a contained subset of Navy needs for its mission. Although the traditional supply chain may be cumbersome and expensive, it works and provides a stable backup for production. 3D printing is a developing technology itself that is fundamentally digital. Since additive manufacturing begins digitally and executes digitally, utilizing blockchain enhances the process by simultaneously replicating the team effort to the distributed ledger. Blockchain is adding to the system, not replacing it. 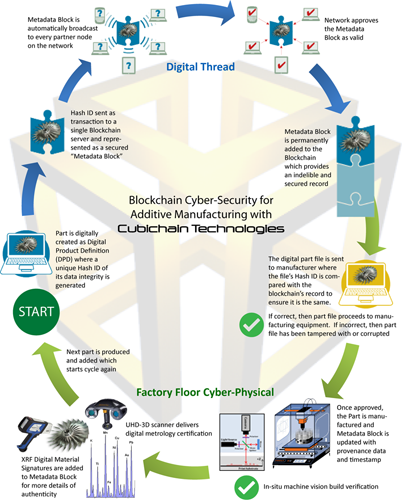 In the summer of 2017, the Navy actually announced plans to use blockchain for additive manufacturing. Numerous US government organizations such as the Center for Disease Control, Department of Homeland Security, Department of State, and Office of Personnel Management are also investigating the possibilities of blockchain in their missions. 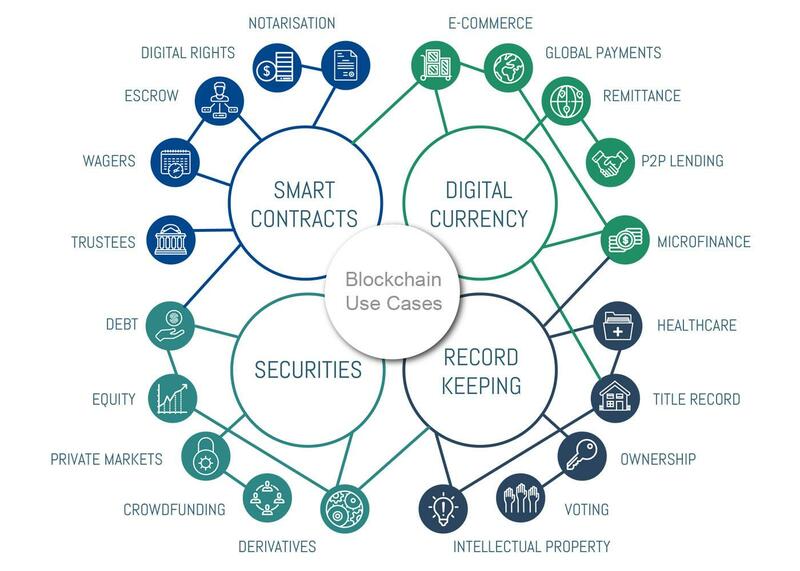 This graphic illustrates the interconnected capabilities of blockchain while still keeping the basic concepts in common buckets.. Additive manufacturing itself is seen as a means to reduce costs and enhance the production cycle in both time and quality. With smart contracts, the additional benefit is simultaneous, irreversible duplication of the production cycle as it lives. All members of the process – start to finish – are active and aware of the function transactions. These members are the selected distributed network of nodes that are integral to the process: creators, engineers, users, legal, accounting and poignant chain of command. Because of the inherent sequential iteration foundation of blockchain, every version of the product – success, failure & in-between – is captured for the network. So mistakes are captured for remediation as well as historical reference functionally or administratively. While the current means for supply aren’t going away, blockchain provides opportunity to further expand the benefits of smart contracts while minimizing the risk. As we move further into operational, identity management is another subset that is already in practice in industry. In a world of biomarkers and data exhaust, an individual can be identified by so much more than a name or a number. Using thumbprints or retinal scans never became as common as future-casts predicted, and even identification cards are losing their power. For example, when is the last time someone checked your ID card when paying with a credit card? The card actually says “not valid until signed,” but is the signature on the back verification for the vendor or opportunity for a forger? A new practice also allows for no signature of the receipt for purchases under $50, which indicates a proven algorithm of risk and return for chasing fraud according to a threshold. 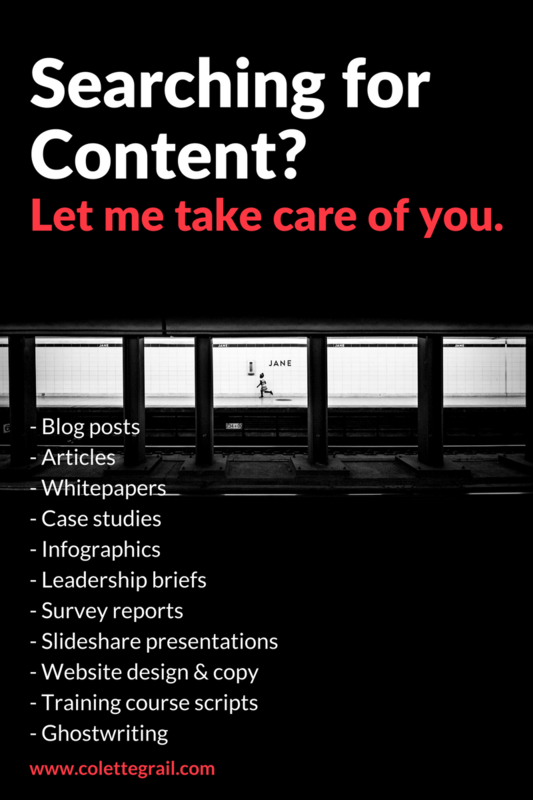 Credit agencies have many more mitigation strategies that subjugate the need to identify the user. Blockchain Identity Management (IDM) has not been accepted as common practice as yet. At this stage, developers are still exploring the technology and with the significant threat of information breeches, it is understandable financial institutions are leading the way. The potential though is being carried in real currency. Blockchain IDM startup Selfkey began its Initial Coin Offering (ICO) with the intent of selling a limited supply through the end of the month. They closed sales in 11 minutes when they reached over $21 million in investment. Last June, Civic raised $33 million through ICO, again closing the sales well ahead of schedule. Another strong demand signal is creating a global identity standard, establishing a common practice for personal identification worldwide regardless of country of origin. Several startups are utilizing bitcoin, blockchain, open and secure networks to meet the demand signal of digital containment. The blockchain holds no PII data, only verification signatures that cannot be reverse engineered. Since blockchain is an ongoing accumulation of data blocks in a chain, think of a person’s identification that way. The person doesn’t change so much as their circumstances. Blockchain is used for identifying diamonds and high-end wines as they travel from point of origin to sales floor. The item itself doesn’t change; its journey defines its identity. Its value is certified by the steps it takes, which are captured as blocks in a chain. Only when the chain is broken or corrupted, then the item not only becomes scrutinized but also the sequence of events can be evaluated for interpretation and judgment. The credit card company knows it is you more or less when you charge and the down side risk is minimal compared to the cost of deeper certainty. Individuals with security clearances by and large keep to the trust endowed. With blockchain identification, the organization and all the individuals who are trustworthy benefit when a single trustee breaking the chain can be identified immediately. Blockchain Identity Management is a good operational application because it does not replace existing trust systems in place. The technology can be “bolted on” to a test unit for determining best practices. The bounded process can then be readily implemented and replicated. Identity management is ideal for blockchain implementation because the ongoing issues of personal identification risk are rising. A light bulb is needed because better candles are not sufficient to hinder hacking.